This project is supported by NASA Grant NNX08AK28G under PPS. The amount of rainfall reaching ground is what affects people directly. Why do we care about the precipitation at other heights? ?One reason is that the vertical structure of a convective system contains important information about its physical processes, and also about its potential for severe weather.? For example, only very intense updrafts can produce and loft large ice particles high into the storm, an indicator of hail or other severe weather.? The presence of precipitation particles at different altitude levels is directly related to latent heat release, which in turn has direct impact on the general circulation of the atmpsphere. Thus, it is important for climate models to correctly simulate the fractional occurrence of the precipitation as a function of height. One recent study suggests that a cloud resolving model embedded in a general circulation model overestimates the precipitation over tropical oceans in the upper troposphere (left figure, Zhang et al. 2008). Besides model validation, the large ice particles at high altitudes are likely associated with strong updrafts and lightning, which have a direct relation to aviation safety. Here we define the presence of precipitation by the existence of a 20 dBZ echo. Then the seasonal and diurnal variation of precipitation occurrence are generated using a decade (1998-2007) of TRMM PR data. 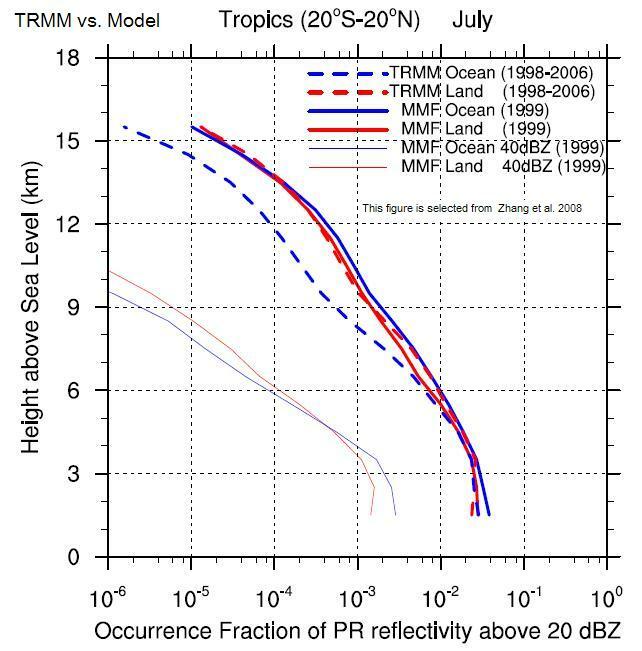 The 20 dBZ fractional occurrence can be easily derived from the TRMM database Level-3 products (detail see data description). Climate Model validation Current climate models do not have horizontal resolution fine enough to depict convective systems explicitly. However, it is still important for these models to correctly simulate the diurnal and seasonal variation of precipitation occurrence in different parts of the world. Aviation Safety The frequency that deep convection reaches the flight level of commercial jet aircraft, mostly from 8-11 km, over different regions of world is important to aviation safety and a major concern for the airlines. 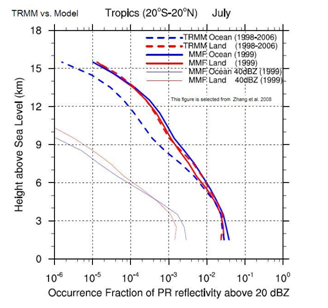 The statistics on convection reaching these altitudes is readily available in the TRMM database, and should be of value to pilots and to the design of safety features in current and future aircraft.